I didn’t intend my response to sound presumptuous, as if I expected not to like it, but those were the first words out of my mouth after a rep from Chevrolet asked me how I enjoyed the all-new 2013 Chevrolet Trax. Chevrolet is targeting the Trax for urban dwellers across the country. It’s meant to meet the needs of drivers faced with congestion on their day-to-day commute while providing enough space for it to be used on weekend getaways and longer road trips. It’s an all-in-one type of vehicle for young city folk. Driving through Ottawa, and then over the Ontario-Quebec border into the Gatineau Hills on a snowy afternoon put this small SUV in ideal conditions to show its worth. The five-door, five-passenger SUV does quite well in the city. The Trax comes in a small package, about a foot longer than Chevrolet’s compact Sonic and only a few inches taller and wider. The small footprint allows it to maneuver well. One of the first things I noticed when behind the wheel was its responsive handling. Making a series of quick turns in downtown Ottawa, where one-way streets often dictate where you go, I felt the Trax move in tandem with the steering wheel. It handles with precision, cinching it as a dependable cute-ute for the city. As I crossed the border into hilly Gatineau, the Trax got to play on snowier grounds. The AWD model I was driving, which houses a 1.4L turbo engine pushing 138 HP and mated to a six-speed automatic transmission (a six-fdspeed manual is standard), took to it pretty well. At times it felt powerless to drive through the wet packed snow it encountered, but every time it somehow made it through. I had a chance to drive a decent stretch on unpaved roads, covered in snow and ice, and it was quite the experience. The Trax’s body shook, rattled and rolled as if an earthquake hit the area. But it survived. In fact, it got through this rough patch of road better than I expected — well, minus the violent shaking —as there were moments I thought it wouldn’t be able to drive at all. No, the Trax isn’t an off-roading vehicle and much shouldn’t be expected of it in this area. But it’s nice to know that it can handle these light duties if needed. Inside, Chevrolet keeps the urban focus front and centre. When equipped with Chevy’s MyLink system (standard on the 2LT trim and above), the aged CD format is eliminated. Thank goodness. In its place is a USB port and Bluetooth streaming. The system syncs with your smartphone to play music, video and other content, plus the to-be-released BringGo app allows you to have full navigation on the seven-inch screen. This allows you to simply download the app (approx. $50), and the MyLink system does the rest – it brings the navigation app to the vehicle’s screen and provides a full-functioning experience. It’s very slick, and ensures you don’t have to make an expensive upgrade to obtain navigation. While the Trax provides reasonable legroom in the backseat, and a decent amount of cargo space, the storage spots up front seem lacking. The oddly shaped side door pockets are virtually useless, and the centre console is occupied with four cup holders. Yes, four. Overkill? Just a bit. I suppose you can turn those cup holders into key, wallet, change, receipt and miscellaneous holders, but the fact they’re all meant for cups just seems like a waste of space. And, yes, the entire cabin is made up of various shades of black and silver. Not the most exhilarating design, but the functionality of it works. Controls are well-placed, easy to reach and quite visible. 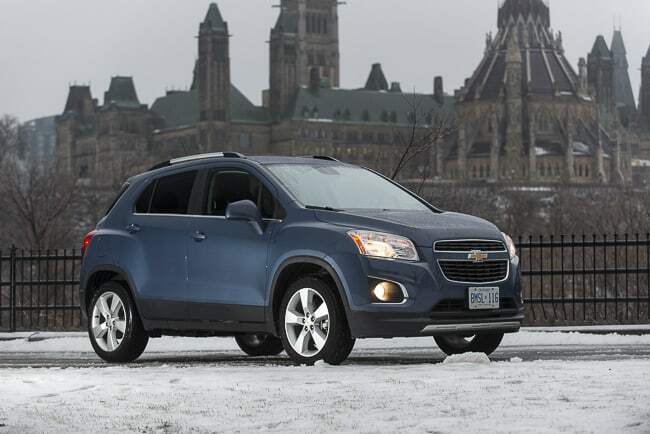 The Chevrolet Trax does a great job positioning itself as a city SUV. With exceptional handling, adequate power and good fuel economy — 6.9 L/100 km for the manual, and 7.1 L/100 km when driving the automatic — it hits most of the major points it should. And, any shortcomings it has with regards to storage and interior design, is made up with their excellent MyLink infotainment system that truly speaks to the demographic Chevrolet is speaking to.